History of the Commodore 264 series of microcomputers, with focus also on Hungary. Commodore introduced its new family of microcomputers in 1983. Its member were the C16, C116, C232, the Plus/4 (formerly named as 264) and the C364 (see the gallery for pictures). 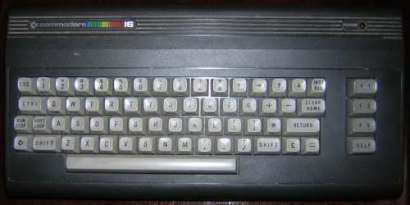 The hardware of the 364 is identical to that of the Commodore 16, 116, 232 and plus/4 except that the 364 includes a built-in Magic Voice speech synthesiser. The 264 and the rest of these machines (their graphics/sound/control chip was called TED) were supposed to strike at the extremely successful Sinclair computers. Unfortunately, Commodore failed to notice that they would also be competing against Commodore's own very successful computer, the Commodore 64. TED was an all-in-one cheap computer chip. It improved on a number of the things that were done in the C64, so one didn't need extra SRAMs, got more color, although the sound sucked a bit. This project was said to be started by Jack Tramiel as an answer to the Timex Sinclair, as well as a replacement for the VIC-20 (eg, a real computer that sold for about $100). The basic idea was to sell a 64K computer, or close, to that market. The result was the membrane keyboard version called the C116. At one point the TED project was split into several machines. There was the C264, which had the full complement of stuff, 64K of RAM, etc. The C232 was a scaled-down version, with 32K and no serial port (TED systems, unlike C64s, has a real 6551 hardware ACIA). Eventually, there was the CV364, which had two weeks between becoming an official, for production unit, and being cancelled forever. Take the C264, add a new version of the Magic Voice (it was called Tragic Voice among Commodore engineers...) speech synthesizer module, add a numeric keypad, and you have your CV364. Two units were actually made with production plastic (it was shown at the '84 Winter CES, but with mock-up casework). The 264 series systems had some advantages over the C64. BASIC 3.5 has real graphics commands in it. It used a dynamic ROM banking scheme, so you got nearly 64K in BASIC (this was later used on the C128). ROM cartridges, and an internal ROM slot, could also be banked. Orginally, the C264 was to be offered with Your Choice of ROM option; EasyCalc, LOGO, etc. Later, it got the horrible 3+1 package, and was redubbed the plus/4. Some time later, a scaled down 16K version was introduced as the C16. This was an even bigger failure and most of them were bargained in Eastern Europe. Although their BASIC (version 3.5) was far more advanced than that of the Commodore 64 (version 2.0), these machines turned to be big business failures, because they weren't 64 compatible and had less attractive sound/graphic capabilities. While these machines had 121 colours, the lack of the great SID sound chip and hardware sprites made them a wrong choice for gamers. The 3+1 built-in "business" software, however, was not serious enough for work. The rational becomes clear when you look at the company politics. Summer of 1983, TED is the answer to Sinclair and replacing the VIC-20. Fall 1983, we have an explosion of TED models. Winter 1984, Jack Tramiel leaves Commodore. Summer 1984, his sons follow him, after pushing the PLUS/4 through. The result: Commodore is left confused about product. Regarding their relative success in Eastern Europe, the most popular member of the family became the plus/4, of which about 150 thousand had been produced in the German factories of Commodore. Ten thousand of these micros arrived at Hungary, having a that time incredibly low retail price. Due to its low cost, the Plus/4 was selected as official computer for Hungarian schools. While the program support for the Plus/4 was poor in Great Britain, literally thousands of programs had been written for it in Hungary. The biggest software distributor was Novotrade. As the first hungarian company limited by shares in the socialist era, Novotrade was founded by four banks and 93 enterprises in 1983 (same time as the Commodore 264 series...). Originally, it was engaged in the import and domestic sale of computer hardware and software. It began licensing software to British, German, French, and Dutch publishers (mostly for Commodore 64). Late in 1983, Novotrade opened an office in California and subsequently engaged Andras Csaszar and Stephen Friedman to join the operation in Budapest, Hungary, and Los Altos, California, respectively. In 1989 Andras and Stephen assumed control of Novotrade’s overseas software division and formed Novotrade International, Inc., a California corporation. In the early years, Novotrade developed entertainment software for many international publishers. It wasn’t a very big industry and it was a difficult business. On the Hungarian market, the situation was much more favorable. Novotrade had quasi-monopoly with two software labels: Octasoft and Deltasoft. They released all kinds of software from education to games and utilities for C16 and Plus/4. The legal successor of the software division of Novotrade is Appaloosacorp, that is developing for game consoles nowadays. It is a strange coincidence that Zsolt Prievara, the author of WinEMU is working for this very company! A second, but far less significant Hungarian distributor was called "Ápisz" (named after the bull from the Greek mythology).